Bluetooth technology is used for many purposes today, especially for connecting different devices through the air. Just as it is used for file transfers between two smartphones, Bluetooth can be used to wirelessly transmit sound to speakers that have this technology. A Bluetooth-activated device that uses Android, iOS and other mobile operating systems can be great for those who want to listen to music wherever they are and to have a high quality audio experience. 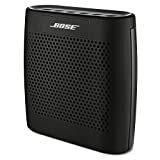 Bose is known for its more expensive sound systems, but this product is an exception. 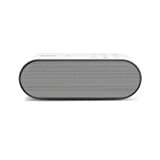 It is a portable Bluetooth speaker that you can use with your smartphone or tablet, it is not very expensive and it is available in five different colors: black, white, blue, mint and red. The device should fit the size of your palm, as it is 5 inches wide, 5.3 inches tall and just a little more than 2 inches thick. Compared to other Bose products, this one is not from metal, but from hard plastic. It also has some silicone rubber for grip on the sides. SRXX2 is one of the newest speakers from Sony and it has a sports design with rounded edges a good performance. 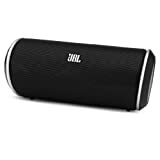 For an affordable price, you get a small Bluetooth speaker, but one that is durable and that has a rich bass. Some people may see the design as a 90’s style of smaller audio systems. It is available in three colors: white, black and red. A green LED indicates the power being on, but also shows the status of the battery: when the battery is low, it becomes orange. The sound is warm and covers a wide range of frequencies. Surround sound can be activated from a button on the speaker. There are also buttons for power, volume, turning the device on and off, Bluetooth pairing and answering calls. JBL Flip 2 s another one of the most recent Bluetooth speaker models. It is the second generation of the Flip device. The design is very interesting, with a cylindrical shape for a device that can be used horizontally and vertically, just like the first Flip. But, Flip 2’s design is slimmer and seems to better fit into the hands of the user. There are other updates that are meant to improve the new product. Made from metal, the grill of the device is sustained by hard plastic and a rubber exterior. On one of the sides, the speaker has buttons for power, Bluetooth, volume and dialing. The jack and the port for charging are on the rubber part. The sound of the device is loud enough to fill a living room.